I was going to be in a long all-day workshop, from 9 a.m. – 6 p.m. at the Seattle Center. The organizers had done exactly what I love to see in an event invitation, which is to say they provided information about all forms of transportation and recommended non-drive-alone choices before talking about parking. How to get there? 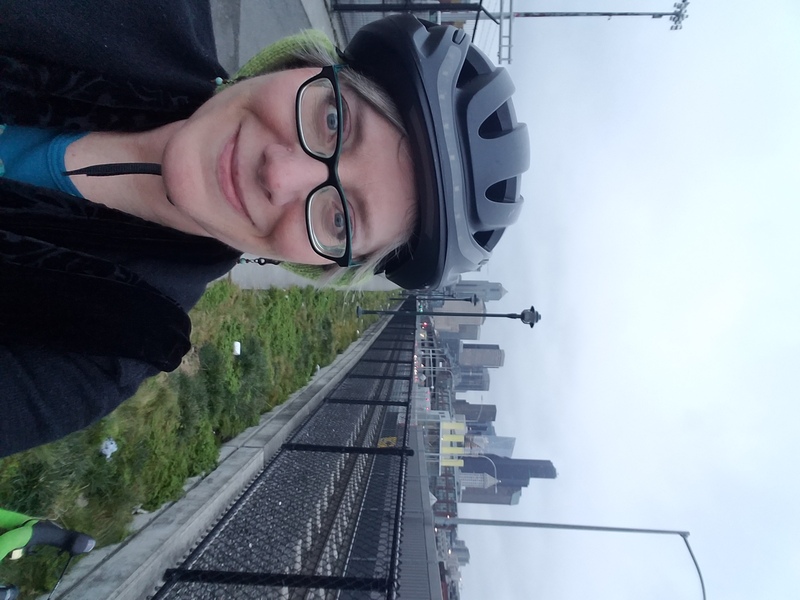 Seattle weather gave me a cool and pleasant ride into downtown. The first part was easy, or at least routine: Ride my road bike there. The venue was about 2.5 miles farther than my 8.5 miles to the office, with that extra mileage via the protected separated bike lane on 2nd Avenue in downtown Seattle. The ride didn’t present any particular issues, just a bit of back-planning to allow for the extra riding distance. I compared biking to busing and biking was faster. I find that’s often the case, given that bus drivers have to stop and I don’t. And a gorgeous ride it was, with cool and pleasant air and no rain, snow, or other reminders of our recent winter blasts along the way. I got into downtown, skipped my usual turn to my office, and headed north. Since the bike lane is conveniently two-way, I just turned around at the next stop light and rode back to my office building in Pioneer Square. There I parked my bicycle securely inside my office and while I was at it set my headlights up to recharge. I walked a couple of blocks to find a Lime bike, unlocked it with the app, dropped my bike bag into the front basket (looping the strap over a handlebar as a backup in case I hit a bump), and pedaled north again. 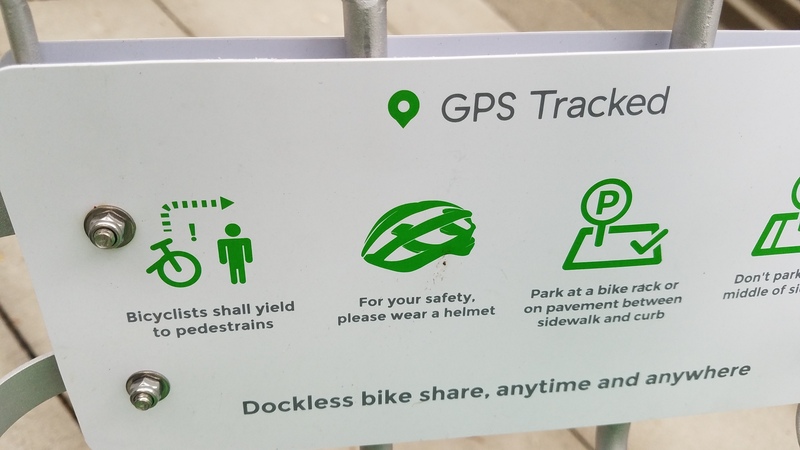 One funny little typo spotted in the instructions on my Lime bike: Bicyclists shall yield to “pedestrains”. I guess that’s a line of a lot of pedestrians. I naturally found the bikeshare bicycle to be a bit tanklike after my lightweight road bike. Hello, e-assist, just help me up this little climb, why don’t you? Thanks. I had another “aha” at the stop light at 2nd Avenue and Denny. I sat on the bike waiting for the light to turn green, looking at a hill that I thought would be hard for me to get up from a dead stop with no time to spin up some momentum before I had to climb. But wait — I have a booster on board! The harder I pedal the more help I’ll get. Thus instead of getting off the bike and pushing it up the hill I just kept pedaling to the top. 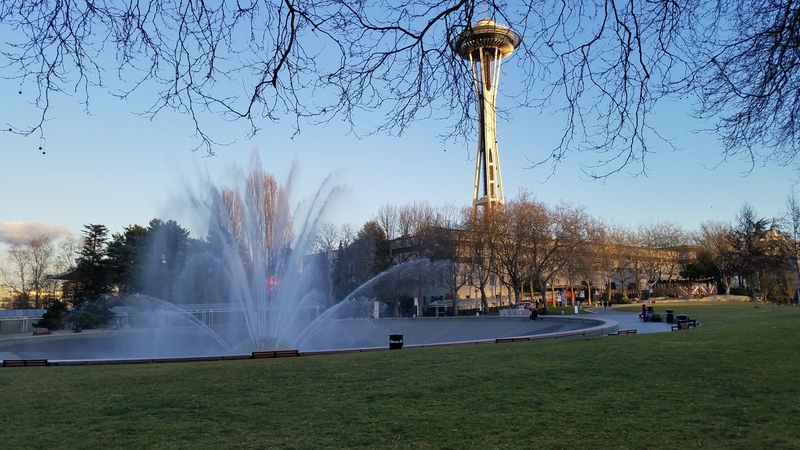 The fountain splashing at the Seattle Center with the Space Needle in the background reminded me of what a beautiful city I live in, with many civic spaces for anyone to enjoy. I found my destination, parked and voila! No bike theft worries all day long. At the end of the day I reversed the trip, this time taking a Jump bike. As I walked in search of an available bike I enjoyed the sunshine, passing a group of 20-somethings all unlocking a mixed batch of Jumps and Limes and talking about where they might ride. With the bikeshare bike parked outside my office building, I picked up my own bike and rode it to my usual bus stop. After King County Metro give me a lift to my neighborhood. I biked home from the bus stop. Bus ride cost: Zero. I have an employer-provided ORCA card for commute trip reduction. Best deal on the planet — access to transit throughout the Puget Sound. Peace of mind about my bike’s security: Priceless. Cost if I had driven: $15 parking + $10.56 vehicle use (18 miles at federal mileage rate of $0.58) = $25.56 + the opportunity cost of the exercise, fresh air, sunshine, and sightseeing my rides gave me + the hassle factor costs of driving, waiting in traffic, finding parking, then remembering where I parked at the end of the day. I know which one is the better deal for me. 3) I already had accounts set up for both bikeshare systems. As I use transportation I think about who it does and doesn’t work for the way it works for me. If I didn’t have a smartphone I would need to have loaded a cash account with Lime in advance and call them to unlock the bike or do something with an email and barcode for Lime Access. At least they’ve worked for ways to pay if you’re unbanked and don’t have a smartphone with data plan.